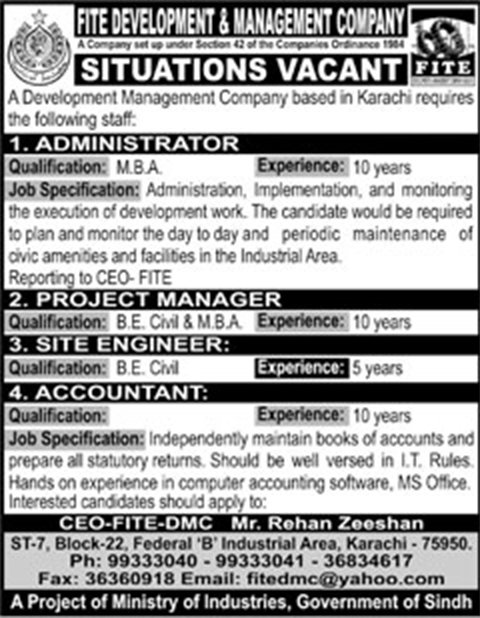 FITE Development & Management Company Karachi Sindh. Job Specification: AdminImplementationplmentation. and monitoring the execution of development work. The candidate would be required to plan and monitor the day to day and periodic maintenance of civic amenities and facilitate in the Industrial Area. Job Specification: Independently maintain books of accounts and prepare all statutory Returns Should be well versed in IT Rules Hands on experience in computer accounting software. MS Office. St-7, Block-22, Federal "B" Industrial Area Karachi.